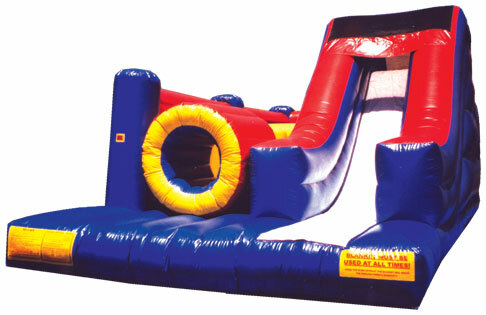 Actual Size: L-30'6" W-15'6" H-12'6"
Setup Area: L-40' W-20' H-12'6"
Test Your Endurance With The Challenger Obstacle! The Challenger is an exciting inflatable play structure for family gatherings, corporate events, school events, and more! 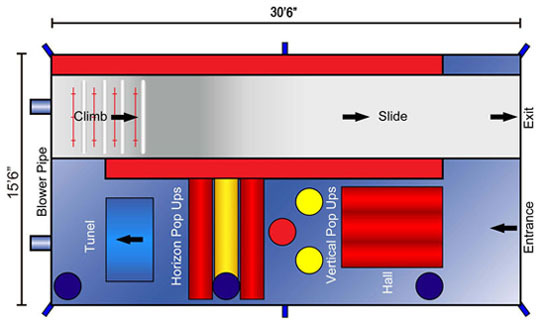 With its left-side hall entrance, vertical and horizontal pop-ups, tunnel, and right-side climb and slide, this Challenger gives an action packed punch to any event, festival or party. This inflatable can be used inside or outside, and is sure to test your endurance! Kids can choose from several different fun and engaging activities in this primary-colored red, blue and yellow inflatable play structure.